SoundMAGIC have a new set of Bluetooth wireless earphones; the ST80s. Aimed at sports enthusiasts, once again we have a product from SoundMAGIC that promises a lot for a little at £89.99. So what did we think? Red, blue or green on black are the spectrum of colour options on offer. 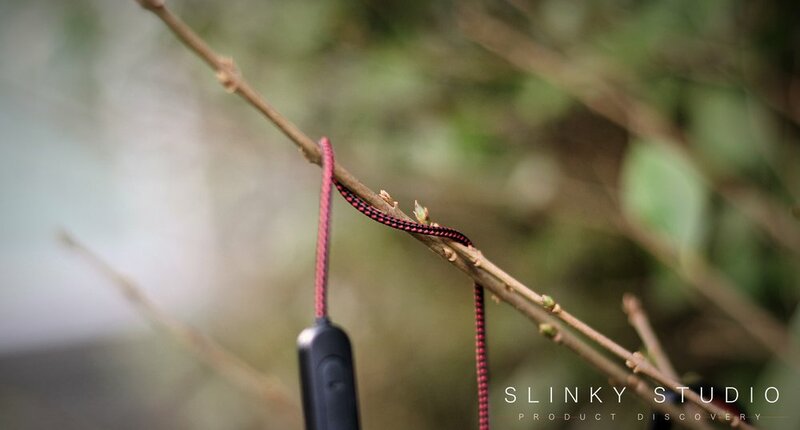 The colours alter the accent of the earphones themselves and the fabric weave of the cable. They’re a respectable looking pair of earphones with a clean profile that uses strong plastics for the outer housing and stainless steel as the structural property. Designed with runners and activity goers in mind the earphones are sweat-proof with an IPX4 rating. Additionally there’s a clothing clip we’ve made use of to keep the cable from waving all over the place when wireless. But most interestingly the cable design is modular, so we can unscrew and switch from Bluetooth to wired in a few seconds. We think this is pretty neat and gives us plenty of opportunity to see if there’s an audible difference between the two options. There are two separate controls for either wired or wireless setups. To be honest the wireless controller, being rectangular and having more positive buttons, is just more comfortable to find and use. The wired one has the same functionality, with volume plus playback controls and a microphone, but it just isn’t quite as easy to grab because it is rounded. The battery is built into the remote control of the detachable Bluetooth cable, meaning it can be charged separately to the earphones via micro-USB (cable supplied). In terms of playback time - we got over 10 hours of audio playback; not too shabby. SoundMAGIC always cater for a varied set of ear sizes and preferences. In total 11 pairs of tips are supplied. 3 silicone single flange tips (S/M/L), 3 Comply foam tips (S/M/L), 4 ribbed silicone tips for active outdoor usage (XS/S/M/L) and 1 set of silicone dual flange tips (M). The ribbed silicone tips offer a tight fit and we’ve been using them for around 75% of the time. With the other 25% of our time we've used Comply foam tips which offer a more leisurely and comfortable fit for hours of back to back music listening. Incidentally, with each ear-hook being fully rotatable and telescopic too, putting them on is less fidgety than with other makes and everyone at the studio found them to be an agreeable fit. Bluetooth vs wired was a difficult one to compare, which is definitely a good thing. Wired does boast of slightly cleaner and more high-fidelity sound, but there's not a heaving gap between the two and the difference is definitely not worth the effort that we iPhone users need to go through when lugging that fragile Lightning to aux adapter everywhere. We’re happily playing our music and general audio wirelessly with the SoundMAGIC ST80 Earphones. Volume power can’t be nitpicked: it’s vicious if you accidentally play something at near full volume and offers more than enough impact to drone out the city bustles on your morning run or the TV in the living room in the evening. 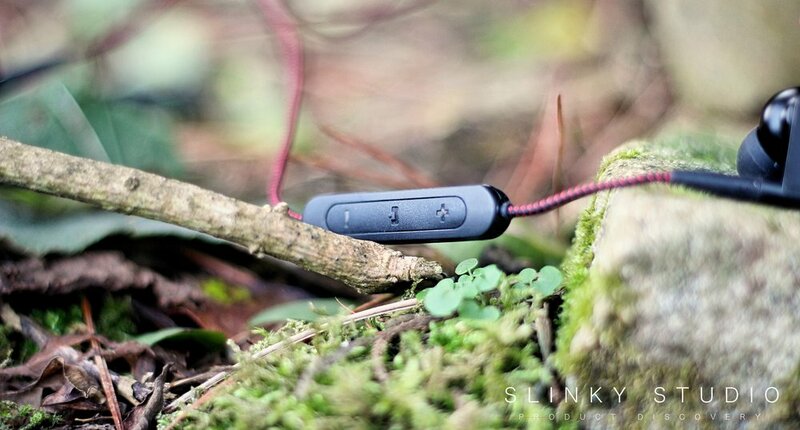 Compared to the noise isolating wireless PKparis K’asq earbuds, the ST80s do produce a deeper bass response. A track like the remixed ‘Love Me Or Leave Me’ by Nina Simone, featuring a penetrating bass throughout, demonstrates a new level of lowness that we just couldn’t quite grasp with the PKparis K’asqs. And for balance amongst the mid and higher ranges, these prove to be a well tuned setup. We can’t really feel any slack with either frequency levels and when working together nothing comes unstuck. ‘Dum Dum’ by Kideko, Tinie Tempah & Becky G, with its shouty vocals and general 'busy-ness', is interpreted as a coherent and powerful performance, which truly hails the SoundMAGIC ST80s as brilliant value. The only critique would be that the soundstage is quite compact, and definition between audio elements like instrumentals and vocals does have room to be more pronounced. A nice attempt at making a rounded feel-good sounding Bluetooth pair of earphones for active lifestyles, with wired capabilities also ready and waiting in the box on arrival if you should so want. However, the difficulty in telling the difference between Bluetooth and wired performance really shines as a testament to a well engineered audio product for the new wireless world.